Do you have your heart set on Knoll's Saarinen dining table with gorgeous tulip base and marble top but cannot afford the $2,500 price tag? One solution is to DIY a similar looking table using Ikea's Docksta tulip table and marble contact paper with this clever DIY. 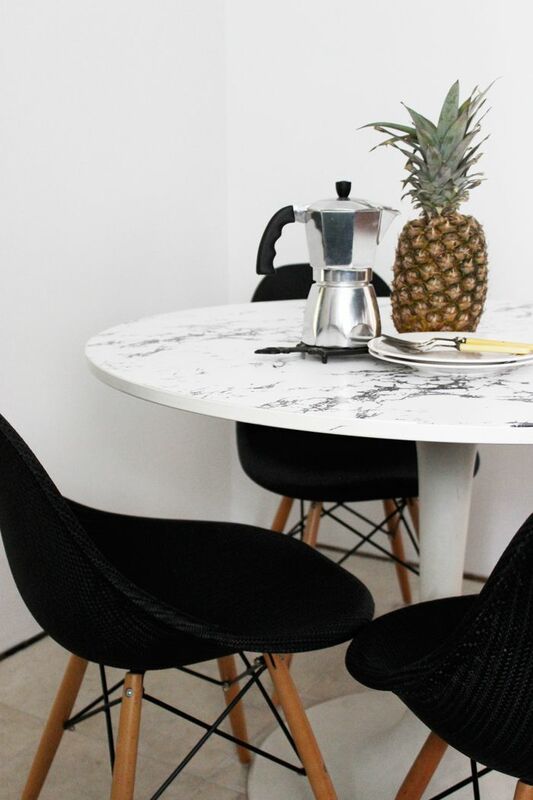 You can try this project to update a new or old dining table by covering the top of the table with marble contact paper to make it look brand new. Update your stationery for your office to look glam by applying marble and copper contact paper over the existing cover of your notebooks. Create a beautiful marble frame that is the perfect way to frame your favorite black and white print, with this simple luxurious DIY that is made by covering the exterior of a photo frame with strips of marble contact paper. Add some greenery to your home by grouping a few small plants together by making these outstanding marble planters that you can craft by wrapping empty food cans with marble contact paper. For your next dinner party serve the meal on a set of these sophisticated marble and gold plates that you can make by covering a wooden circle plaque with marble contact paper and adding heat transfer gold vinyl for a decorative edge. Get ​organized by adding some decorative marble storage boxes to your home that make the perfect accent for your desk or bookcase that you can use to store all those small trinkets you have been collecting. To keep the decorative boxes affordable to make this craft uses inexpensive marble contact paper to give the luxurious finish to the handmade paper boxes. Update your nesting tables to look brand new by painting the legs of your Ikea nesting tables gold and applying marble contact paper to the table tops to create some posh side tables for her living room. This Ikea hack by Poppytalk is the perfect way to add a glamorous look to your living room by covering the top of Ikea's Klubbo coffee table or any of lack tables with a beautiful white marble contact paper. Make a small update to your kitchen by organizing all your kitchen utensils by keeping them within reach on your counters in a decorative marble kitchen utensils holder that you can make with marble contact paper. Update your bland wood kitchen utensils with the leftover pieces of marble contact paper you have from your other DIY projects by wrapping small strips of contact paper around the handles of the kitchen utensils. This simple update gives a quick custom look that makes lovely utensils for serving food. Here is another great project with you guessed it— marble contact paper! Cover the board of your clipboard with a piece of decorative marble contact paper for a quick update to your office supplies. Paired with some DIY marble notebooks your office will look spectacular. Have small pieces left of marble contact left? If so they would be perfect to use to make your own set of marble coasters by applying marble contact paper onto square tiles to make your own set of outstanding coasters for the table. Cover a rectangle piece of inexpensive MDF board with marble contact paper to create a tray perfect for stylishly arranging object together on your coffee table, such as coasters, candles, plants or books. This quick DIY works best when you have a smooth glass base on a table lamp. Wrap the base of your lamp with beautiful marble contact paper to make a chic decorative lamp for your home. Craft your own beautiful stationary to mail your letters or invitations by making your own marble envelope with gold liner. These embellished envelopes would be the perfect way to mail out invitations for weddings or other fancy events you are hosting.